"Artistic Gymnastics is a creative blend of daring and control; powerful yet refined, elegant yet strong. Mastery on the four apparatus requires skills that flip, balance, swing and soar. *Definition and description of Artistic Gymnastics come from the Gymnastics Australia website. At AOSR, classes are open to all students, male and female, from Kindergarten to High School. Students are distributed in homogeneous groups according to their level of ability rather than by age. 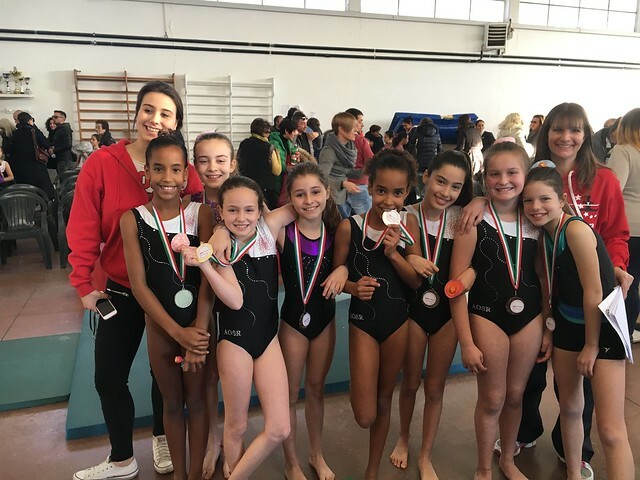 At the end of the school year, all children can participate in the final competition that takes place in our gym and perform one or more of the techniques learned during class: vault, beam and floor exercises. Each child will be taught a routine to each of these technique and the gymnasts will demonstrate their skills and the progress made during the artistic gymnastics lessons. A big thank you goes to Lauren Waite, Elementary Computer Teacher, for her amazing job in editing the video.